The project envisages the construction of capacities for the processing of 45 billion cubic meters of gas and for the production and shipping of 13 million tons of LNG, up to 4 million tons of ethane and over 2.2 million tons of liquefied petroleum gases (LPG) per year. The complex will be processing ethane-containing gas produced by Gazprom from the Achimov and Valanginian deposits of the Nadym-Pur-Taz region. The gas remaining after the processing (about 20 billion cubic meters) will go into the Company’s gas transmission system. 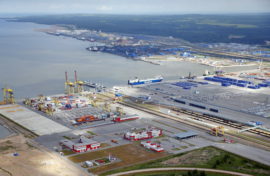 The operator’s priorities include the development of basic and detailed design documentation and the launch of land planning activities at the leased site of the future complex in the southern part of the Ust-Luga port (1,400 hectares). It is also planned to devise contracting arrangements within the project, designate EPC contractors, and place orders for long lead items. This large-scale project is of great significance for Russia’s social and economic development. During its most active phase, the construction will involve over 25,000 specialists, with more than 5,000 permanent jobs to be created to man the operation of the facility.